Are your children becoming adults, or just adult-aged children? 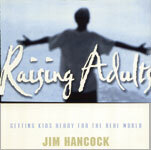 Jim Hancock challenges assumptions and creates common ground giving you the tools that teach children to accept responsibility and gain an adult perspective on life. IF EVERYONE COULD UNDERSTAND THEIR CHILDREN, RAISING THEM WOULD BE EASY. You don't have to look far down the street to see it's not. Raising Adults is not about assigning blame and beating each other up. It's about starting right where you are to raise responsible grown-ups. It's about understanding how we got to where we are. And it's about practical things moms, dads, teachers, coaches, youth workers, employers, and law enforcement officials can do better. Ultimately, it's about learning to understand your kid's world, their sometimes unnerving sophistication, their periods of withdrawal, their anger lurking beneath the surface, their apparent lack of motivation, their cynicism. It's knowing that if you can understand, you can make yourself understood. It even includes a 30 Day Guarantee to help you avoid communication disrupters like mind reading and shaming. Raising Adults will help you build or rebuild a relationship strong enough to last the rest of your life. IF YOU'RE RAISING CHILDREN-STOP! IT'S TIME TO START RAISING ADULTS.